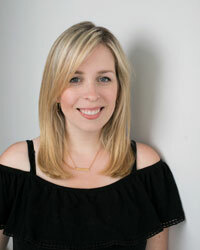 When we moved into the farmhouse, one of the things I was most excited about was having a new bright white kitchen. I know I’ve talked about my love of white kitchens before and you better believe this is one of the things I was most excited about when we bought the house. It’s the only room in the house that had already been updated by the previous owners, with all new cabinets and shelves. I could hardly wait to get it decorated and add some personal touches. I’m still trying to figure out where things go and I’ll probably rearrange the shelves and cupboards a million times before it’s all settled, but I already feel at home here. 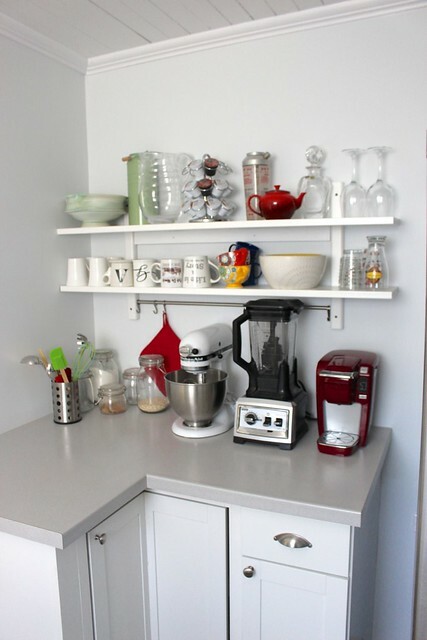 There is less storage than our little apartment kitchen but way more counter space for doing important things – like baking cookies! 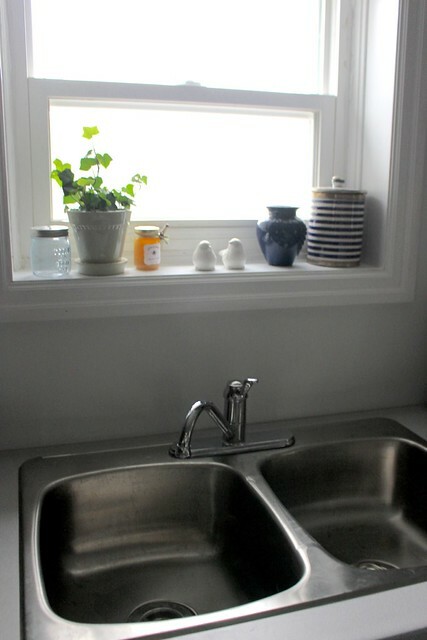 For the most part, I love the finishes and pieces that they chose for the kitchen renovation, but there were a few things I knew I wanted to change right away, like the kitchen faucet. It was short, hard to maneuver around and didn’t add to the space. One of the first upgrades we’ve done to the house is installing this Delta Touch2O Technology Faucet. 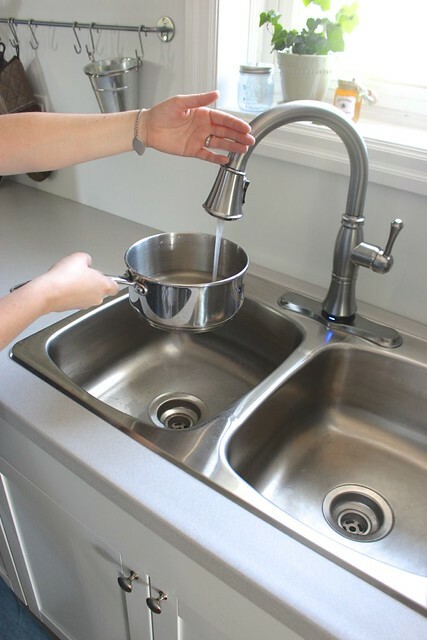 It lets you start and stop the flow of water with a simple tap anywhere on the spout or handle. This is HUGE for me. I can be covered in flour and just reach over with my wrist to touch the faucet and turn on the water. At first, I thought it would take me awhile to get used to it, but it’s very intuitive and within the first day I was doing it without thinking. 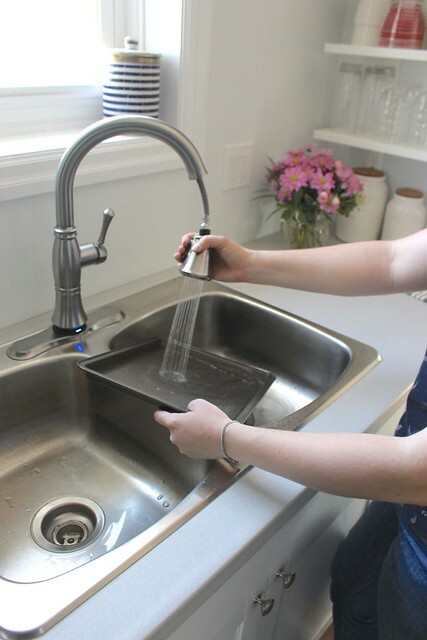 No worries about getting the faucet handle dirty – which is a big thing with all our house renovations too. I’m washing my hands all the time. It’s also helping us conserve water because I can turn it off so easily while filling a pot of water, rinsing dishes or topping up the dogs’ water bowl. No need to let it run unnecessarily! Garrett’s favourite part – the pull-down sprayer. He is the main dishwasher in the family and his biggest pet peeve is trying to rinse all the hard to hold pots and pans, and this makes it much easier. 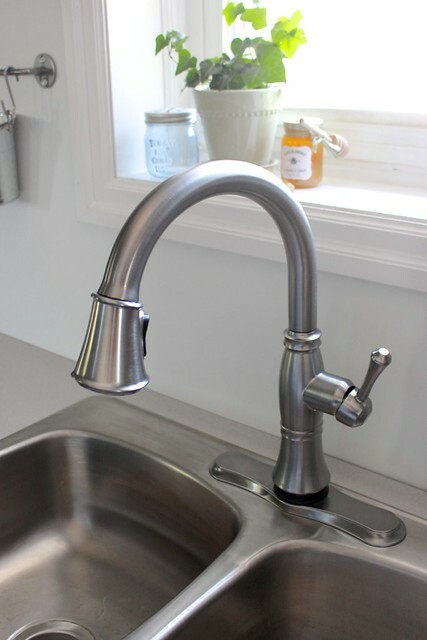 I chose the Cassidy Single Handle Pull-Down Kitchen Faucet as I felt the details added to the classic look we’re going for in our farmhouse kitchen. The arctic stainless finish perfectly complimented our stainless steel drawer pulls and appliances. There are so many different styles and finishes to choose from to suit every kitchen. The installation was straight forward too with the help of Delta’s easy to follow manuals and videos. Want to know more about Delta Touch2O Technology and how it can bring your kitchen faucet game to the next level? Living in a home you love is seriously the best! I love all of the special touches you have added to your kitchen. The faucet does look amazing. Everything looks so fresh! Enjoy! Absolutely beautiful, I love it!! 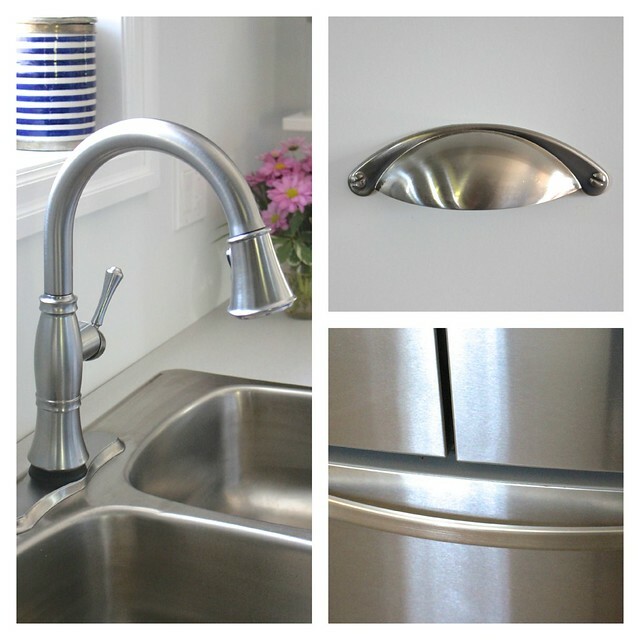 The look is beautiful with your new faucet! I just love the kitchen. 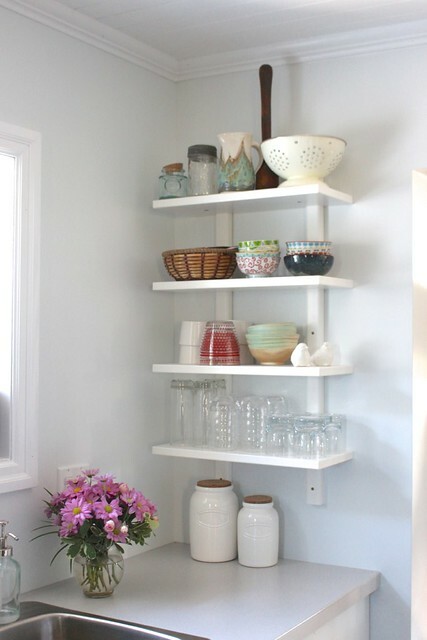 The open shelving are beauty and that faucet. I have one too and it’s just my fav new thing! 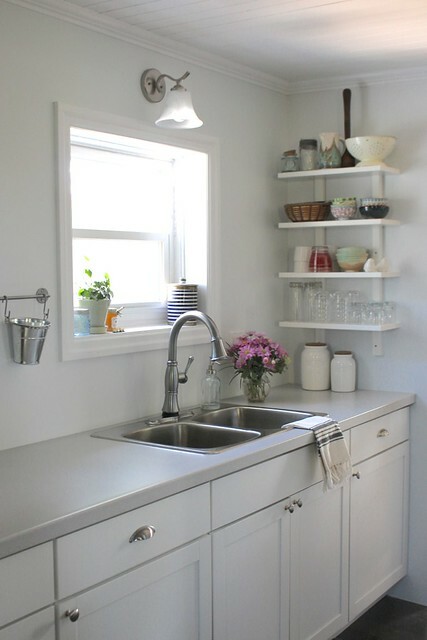 This is a really cute kitchen! Glad you like the faucet. 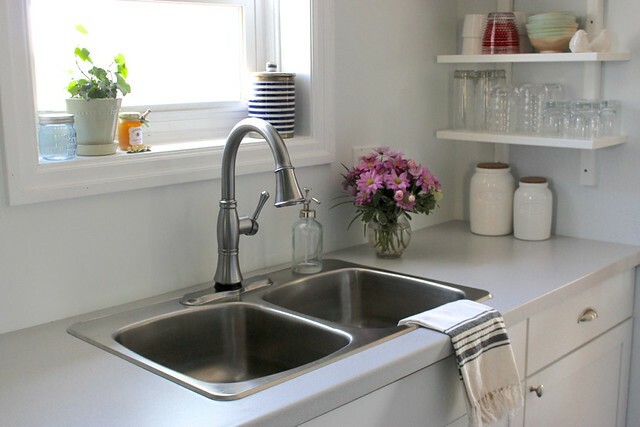 Oh that faucet looks perfect in your lovely kitchen!! Such a charming farmhouse kitchen! I love the faucet you picked… bravo!! Your kitchen is so charming! Ours is ripped apart and I can’t wait for it to start to come together. We’re installing a Delta faucet too.